The relics of a 16th-century church built by Spanish colonisers has emerged from a reservoir in the south of Mexico. 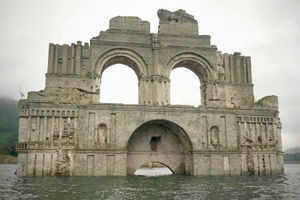 It is the second time the church, usually submerged on the reservoir bed, has been revealed in the state of Chiapas as a result of drought. A water level drop of at least 80 feet in the Grijalba river which feeds the reservoir has revealed the 400-year-old roofless religious building, with its 10 metre high walls, 61 metre length and 14 metre wide hall. The river was last this low in 2002, when visitors were able to walk about inside the church. Today, fishermen are ferrying curious passengers around the ruins, which were submerged in 1966 when the nearby dam was completed and the area flooded. It is linked to a famous figure in Spanish history, namely Friar Bartolome de las Casas, who arrived in the Quechala locality in the mid-16th century with a group of monks that built the church. Bartolome de las Casas was the first Bishop of Chiapas and initially supported the colonisation and subjugation of the native Indians of the region. In later years, however, he advocated strongly for the abolition of slavery, both in situ and back in the Spanish court of King Charles V.
He managed to get the New Laws passed in 1542 which curtailed many of the slavery practices in Peru. They were so unpopular with settlers in the South America that King Charles backed down and removed some of the most important aspects of the legislation. The church depended on the nearby monastery of Tecpatan, and was on the Chiapas’ king’s highway, built by Spanish settlers and still in use in the 20th century. As cool as this picture is, it is really scary that the water has receded this much. My son works for an international company that is all about water across the globe. Chris says that there will be wars over water or lack there of. We can not survive without it! I believe it! This entry was posted in Architecture, Travel, Uncategorized and tagged Mexican reservoir, Mexico, plagues, reduced water table, ruins of 16 C Church, slavery. Bookmark the permalink.